Again providing premium options, the 2016-17 Upper Deck The Cup Hockey checklist includes 200 base cards numbered to 249 copies. Parallels come as Gold Foil (RC #/24; Base #/12), rookie Red Foil (#/8), base Black (1/1), and Masterpiece Press Plates (1/1), which covers both the base and rookie subjects. In addition, low-numbered foil parallels offer auto relic choices for select names. Ultimately what many collectors are hunting for in the set, the first-year autographs provide quite a selection. 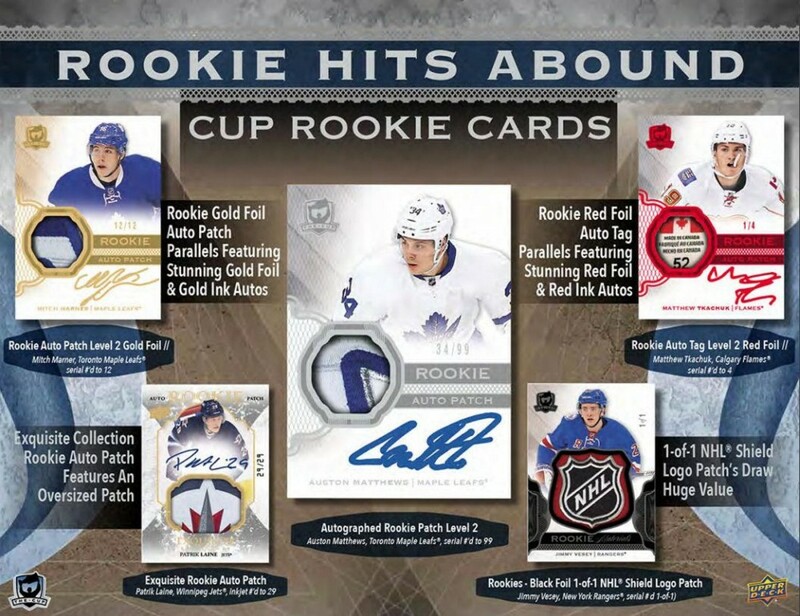 Most popular is the Rookie Auto Patch (Level 1 - #/249, Level 2 - #/99) set with top names like Auston Matthews saved for the more limited Level 2. These also have rare foil parallels to chase, including the Gold Foil (#/24 or #/12) with gold ink and Red Foil (#/8 or #/4) with red ink signatures. In addition, Rookie Auto cards (#/249) add Gold Foil (#/24), Red Foil (#/8) and Black Foil (1/1) parallels. Of course, The Cup is not shy about signed relics, and the extensive lineup has plenty more to hope for when you break into it. 2005-06 Rookie Tribute (#/10) looks to the previous decade for inspiration, while the popular Limited Logos (#/50, #/25 or #/10) cards are back again. Honorable Numbers and Duals are hand-numbered to the jersey number with an accompanying die-cut relic piece shaped like the number. 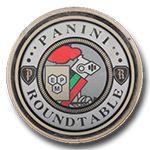 There are also limited Scripted Materials (Base #/35; Duals #/15), Signature Materials (Base #/99 or #/25; Duals #/35 or #/15) and Emblems of Endorsements (#/15) inserts. And for many, you can't think about The Cup without also hearing Exquisite. 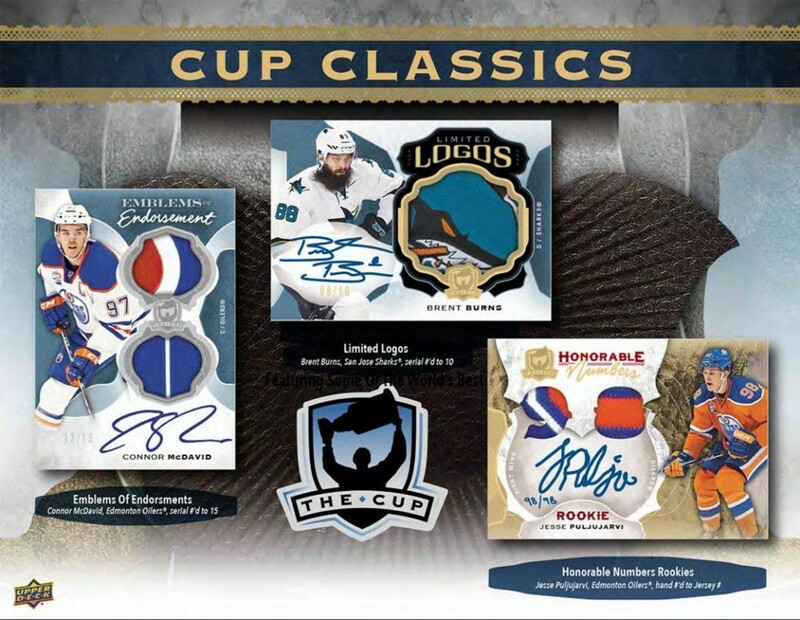 That tradition continues in 2016-17 Upper Deck The Cup Hockey with Exquisite Endorsements (#/50 or less) and jersey-numbered Exquisite Rookie Auto Patch cards. Finally, if you're looking for something that really catches the eye, there's the Auto Gear Booklet (#/24 or #/12) and Autographed Monumental Patch Booklets (#/6 or #1/1). You didn't think we were done, did you? 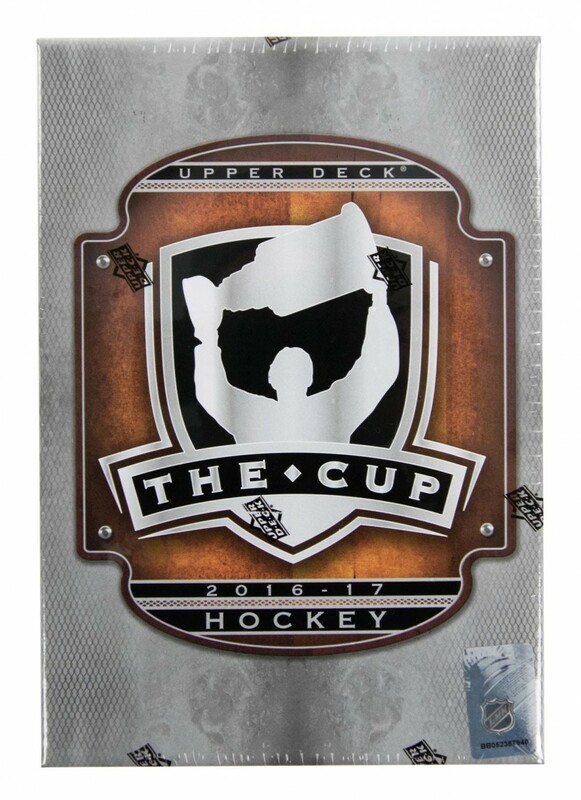 The 2016-17 Upper Deck The Cup Hockey checklists continues on with more impressive inserts. Other signed sets include Brilliance (1:8 packs), Enshrinements, NHL Glory (#/10), Program of Excellence (Base #/10, Dual #/5), Signature Renditions (Base 1:7, Combo 1:100), and Top 10 Picks Autographs. 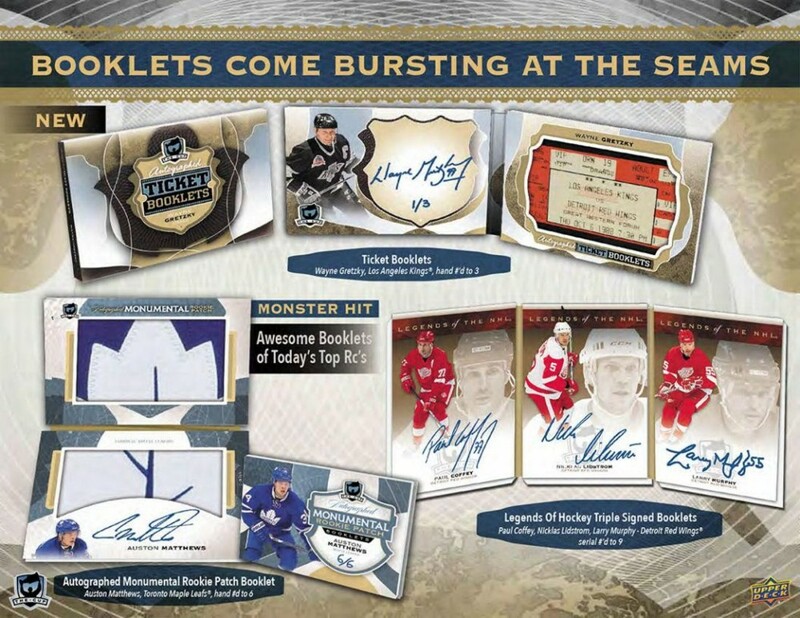 Standing out are the tri-fold Ticket Booklets featuring game-used tickets and player stat inscriptions, and Legends of Hockey Triple Signed Booklets. Switching gears, The Show is not limited to only hockey as it includes autographs from NBA stars like Ben Simmons. As far as relics go, familiar lines such as Cup Foundations Quad (Base #/25; Rookie #/49) return, along with Cup Trios (#/25), Cup Quads (#/10), and Cup Sixes (#/5). More unique, Laced Up is a new insert with game-used pieces from the skates. And we can't leave out Championship Etching (#/15) and the legendary Notable Nameplates.